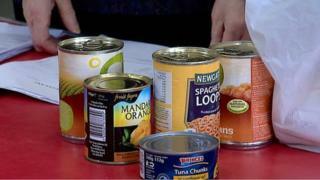 The UK employment minister has said rising food bank use is not the fault of Westminster's welfare reforms. In a letter to the Scottish government, Esther McVey said food bank use was increasing across a number of different countries. She said there was "no robust evidence linking food bank usage to welfare reform", despite reports from the charities suggesting this is the case. The SNP described her letter as "heartless". Ms McVey also turned down a request to meet publicly with the Scottish Parliament's welfare committee, but said she would meet them informally. In her letter, seen by the BBC, she stated "the rise in food banks predates most of the welfare reforms this government has put in place". However, figures from the Trussell Trust have indicated an increase of more than 300% in the past year. Ewan Gurr from the Trussell Trust said: "All the empirical evidence and research shows that welfare reform is the main force driving increasing demand for food banks. "Food banks are responding to a need that has always existed but welfare reform has exacerbated that. "The rising cost of food and fuel is also a factor driving in the need for food banks but all the research indicates the key factor is welfare reform. "All we are asking is that the UK government takes note of this and provides some creative solutions. In 2012-13 the Trussell Trust supported 14,318 people. In the past financial year we supported 71,428. The numbers speak for themselves." The letter from Ms McVey came after growing cross-party concern amongst MSPs about the increasing demand for food banks in Scotland. Neil Couling of the Department for Work and Pensions (DWP) gave evidence to the Scottish welfare reform committee last month. After which Minister for Housing and Welfare Margaret Burgess wrote to Ms McVey to express her concerns. This letter was her response. SNP MSP and member of the welfare committee Kevin Stewart said: "This heartless letter from Esther McVey shows that the UK government has washed their hands of the ever growing number of people being forced to rely on food banks. "The extent to which the Westminster government will bend the facts in order to try dodge their responsibility on this issue is astonishing. "The crux of the letter is that Ms McVey has refused to formally attend the welfare reform committee to answer questions about the very policies she is enforcing on vulnerable people. He added: "The UK Minister has offered some form of informal meeting - but what has she got to hide? "This offering is effectively her snubbing the Scottish Parliament and the people of Scotland - it is a gutless proposition." A DWP spokesman said: "The truth is that we're spending £94bn a year on working age benefits and the welfare system supports millions of people who are on low incomes or unemployed so they can meet their basic needs. "The OECD (Organisation for Economic Co-operation and Development) say there are fewer people struggling with their food bills compared with a few years ago, and our reforms will improve the lives of some of the poorest families in our communities by promoting work and helping people to lift themselves out of poverty."